Dr. Jerry Gundersheimer of Dr. Gundersheimer’s Eye-Do Optical in Sherman, Texas, was born in Atlanta, Georgia, but grew up in Miami, Florida, where he was (and remains) a die-hard Dallas Cowboys fan. He graduated from Florida State University with his Bachelor’s in Psychology, then received his Master of Psychology degree from Virginia Tech. After moving to Houston, he felt that optometry was his true calling, so he enrolled at the University of Houston College of Optometry. An optometrist in Sherman since 1986, he is a past president of the Sherman Noon Lions Club. You might have caught him on stage with the Sherman Community Players. He has also served on the boards for the Sherman Community Players, the Sherman Chamber of Commerce, and the Walmart National Vision Advisory Council. He and his wife, Debbie, attend Sherman Bible Church, and together they have 6 children and 13 grandchildren. 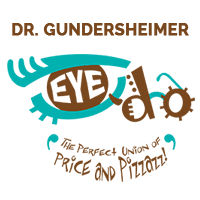 Dr. Gundersheimer has been serving the vision care needs of northern Texas and southern Oklahoma individuals for over 27 years. He was voted “Best Optometrist in Texoma” for 5 consecutive years, and was again among the top three in 2018. He has devoted himself to the vision requirements of needy schoolchildren and has provided countless eye examinations and glasses through the benefaction of the Sherman Noon Lions Club. He and the club are available for vision screenings at any campus or area-wide health event. When he’s not examining eyes, he is an avid keyboard player—having copywritten over 200 songs, and penning an entire rock musical. His other hobbies include photography, acting, and writing. With regard to the latter, Dr. G’s first fiction novel, Face of the Bell Witch: Book One of The Medium Series, has received numerous awards and accolades.